The first two (from Hala-Bala) I posted a couple of years ago, and they were identified as Drupadia ravindra moorei, rather dark aberrant individuals. I can no longer find that post searching ButterflyCircle or using Google. I would welcome comments on the other 4 images primarily. I have tentatively identified all of these as Drupadia ravindra moorei, but am not confident. Image 1. From Hala-Bala. Previously identified on ButterflyCircle as Drupadia ravindra moorei. Image 2. From Hala-Bala. 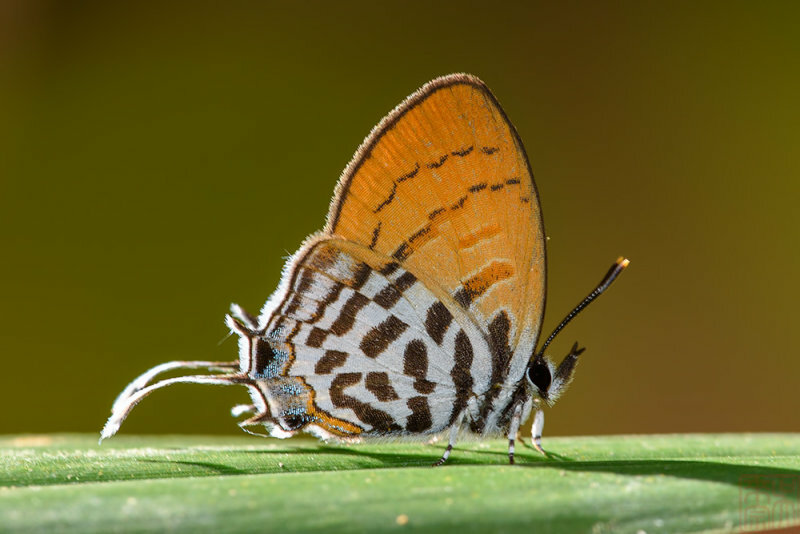 Previously identified on ButterflyCircle as Drupadia ravindra moorei. Image 3. From Hala-Bala also. Image 4. From Phuket island. Image 5. From Khao Luang NP, Nakhon Sri Thammarat province. Image 6. From Sri Phang-nga NP, Phang-nga province. Nos. 4, 5 and 6 are all D. theda, recognisable from the outer black bars on the hindwing being filled with white. Many thanks for that. Indeed I see your point about the dark dusting on the hindwing of D. rufotaenia. Some care is needed in the ID of Drupadia. D. ravindra is extremely variable with many subspecies. 1 & 2 are D. rufotaenia rufotaenia male & female (Note longer palpi length & rounder FW in the female. D. rufotaenia ;small size (1/2 of D. ravindra); HW heavier markings solid black ;black marginal spot in space 6; narrow orange band along border of blue scales run along the black spot but not reliable. 3. Drupadia ravindra moorei. HW markings solid black ;margin of space 6 only lightly dark-shaded. ;orange band beside blue scales not extending beside black spot; UpF black. 4 Male & 5 & 6 female Drupadia ravindra boisduvalii Similar to ssp moorei but postdiscal band 'hollow'; UpF with an orange band. HW postdiscal bands 'hollow'; sub-basal black band broken into 3 separated spots; postdiscal band form 3 series of dashed lines in apical area; FW basal black bar short & at right-angle to base. Many thanks for the detailed replies. Very educational. Oh no i forgot that Northern and Southern Thailand tend to have different sspp. and D. ravindra happens to be very variable across its vast range. Thanks for the correction!